Some of Connecticut’s major health insurers are seeking rate increases far beyond medical inflation, including an average increase of 26.8 percent for the individual plans offered by the state’s biggest insurer, Anthem Health Plans, according to filings made public Monday. Insurance Commissioner Katharine Wade has scheduled public hearings in August on the rate increases sought by Anthem, Aetna and ConnectiCare, three of the 14 insurers seeking increases on 18 individual and small employer plans providing coverage to 332,126 people in the state. The filings come as the insurance industry, Wade and her department are under intense scrutiny as health insurers are undergoing a period of controversial consolidation, with Anthem seeking a merger with Bloomfield-based Cigna and Hartford-based Aetna seeking a merger with Humana. Connecticut drew fire from consumer advocates when it recently joined 13 other states in signing off on the Aetna-Humana deal. Matthew Katz, chief executive of the Connecticut State Medical Society, recently predicted that if the two proposed mergers are approved by state regulators and the Justice Department, about 64 percent of the Connecticut health insurance market would be controlled by one company, Anthem-Cigna. 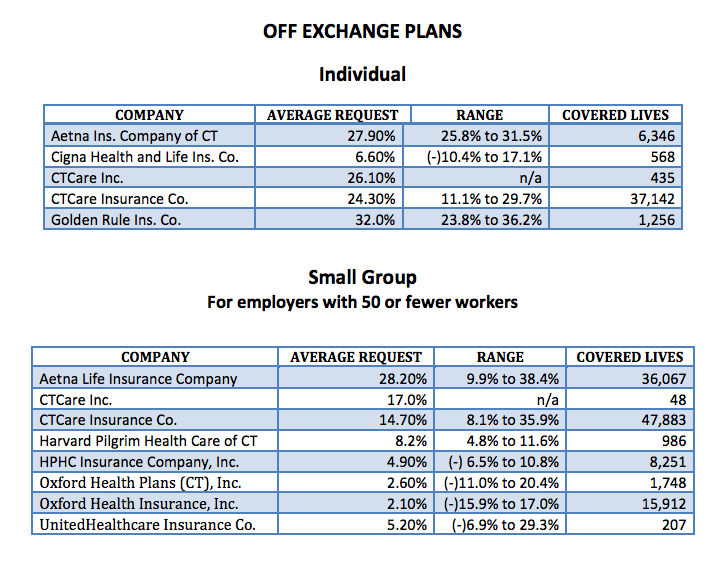 The requested increases ranged from a low of 2.1 percent sought by Oxford Health to 32 percent sought by Golden Rule, both for plans offered outside Access Health CT, the state-sponsored exchange created under the Affordable Care Act. A public comment period on all the increases began Monday and will remain open for 30 days or until the filing is closed, which generally takes longer. 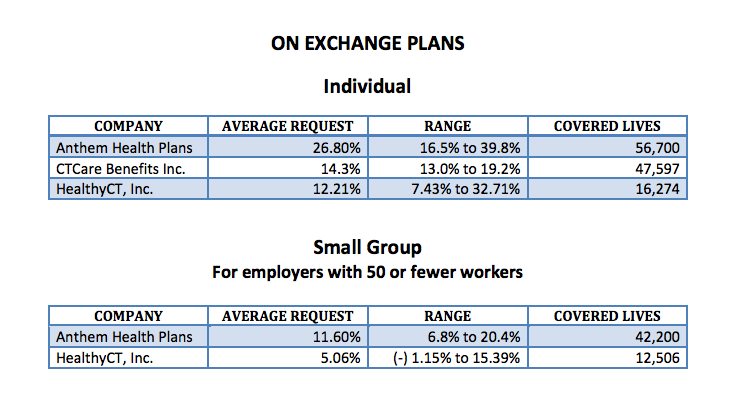 The rate increases are for individual and small-group policies offered to employers with 50 or fewer workers. More residents get coverage through larger employer plans, which are not part of this review process. The department has the authority to reject or modify rates, based on its review of the filings. One reason cited by the insurers is the discontinuation of a federal reinsurance program that provided money to insurers from 2014 to 2016 to offset costs from the early years of the Affordable Care Act. The assumption was an influx of the newly insured would yield high-costs claims from individuals who had long gone without care. A Connecticut Insurance Department analysis says other key drivers are the rising costs of drugs, as well as what the department calls “experience adjustment.” As the ACA, also known as Obamacare, enters its fourth full year of coverage, the previously uninsured are more familiar with care systems and are seeking more services. Once the rates are set, the actual increases paid by specific consumers will vary. Each customer’s actual rate is based on three factors: age, as older people pay more; geography, with consumers in Fairfield County typically paying the most; and the specific plan the person picks. Many consumers also get discounts on their premiums, subsidized by the federal government as part of the health law. The U.S. Department of Health and Human Services says 85 percent of consumers getting coverage through an ACA exchange receive tax credits that protect consumers from premium increases. Tax credits increase if the cost of the second lowest-cost plan, the silver level, goes up. Jonathan Gold, a spokesman for HHS, said rate increases on individual plans also are mitigated by the ability of consumers to shop around through the marketplaces created by the ACA. Last year, about 40 percent of returning customers to HealthCare.gov, the federal exchange, switched plans and saved an average of $42 per month, he said. All the filings can be viewed online. Public hearings will be held at 9 a.m. on August 3 on Anthem’s filing and August 4 on ConnectiCare and Aetna at the Connecticut Insurance Department, 153 Market St., Hartford. Plans offered through the state-run exchange, Access Health CT.
Plans offered outside the state exchange, Access Health Care CT.
Arielle Levin Becker contributed to this story.